Classically Liberal: Flubbed terrorists known to government. The Nigerian who tried to light explosive strapped to his leg was known to the U.S. government. Umar Abdulmutallab's name was added to a list of known or suspsected terrorists by the government a month ago. However, when the man's name was run through the database, before he could board his flight, it came up with a green light. There was no warning of any kind. There wasn't even a suggestion that he be put under additional scrutiny. Instead of focusing on people the government KNOWS to be risks the bureaucrats prefer to go after everyone. There are new restrictions on hand luggage put into place—yet the explosives the man carried were strapped to his leg and never in hand luggage. There is the new regulation confining passengers to their seats yet the man was in his seat when he tried to light the explosive. Abdulmutallab would have been in compliance with all the new restrictions imposed by the government had they been put in place before he boarded the plane. In other words, NONE of the new regulations would have had any impact on the incident. These regulations do not prevent incidents such as the one that happened, that is clear. The incident is merely an excuse for the additional regulations not a justification. Take the new rule on one piece of carry-on luggage only as an example. Abdulmutallab had only one piece of carry-on luggage. In fact, it was the only luggage he had. Apparently no one found a man flying thousands of miles, with just one piece of hand luggage unusual. His ticket showed him being on his trip for almost two weeks—yet he had no luggage and no one found that unusual. He was on a list of suspected terrorists which exists to allegedly warn airport security about yet the U.S. government gave the man the green light so security staff were not even warned to give the man a bit of additional scrutiny. Instead of focusing on ways in which the existing failed the bureaucrats like Napolitano look for ways to complicate the lives of innocent people. One month ago our government listed Abdulmutallab as a potential terrorist and yet they approved him to fly without even a hint that he might be a problem. The failure was not the result of too little regulation, as Napolitano is always inclined to think, it was the failure of government. Having the travel gestapo spend more time hassling flyers is no help. All it does is tie up security staff with millions of innocent people. Since the government knew that Abdulmutallab was a potential risk the most sensible thing to do was to ask security staff to check him out thoroughly. When the man checked-in, was on a list of potential terrorists AND had no checked luggage that should have sent alarm bells ringing. But no one, other than the bureaucrats, knew he was on the list. Security at the airport was never told. Notice that the failure in security belongs heavily to the bureaucrats in Washington for failing to sound the alarm bell for extra scrutinty. It partially belongs to security staff for not wondering about the absence of luggage. Instead of addressing precisely where security failed, Napolitano pretends the problem was not enough state control and ups the level of regulations stripping Americans of freedom. This is why I don't think there is a war on terrorism, there is a war on freedom however. Everytime some would-be terrorists does something the U.S. government, instead of actually focusing on the individuals with a known tie to terrorism, clamp down on the traveling public. 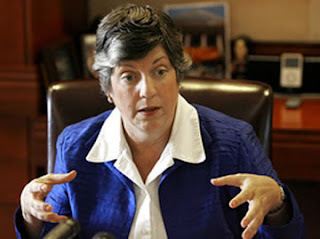 Photo: Janet Napolitano illustrating how to slowly grab liberty by the throat. posted by blog owner at 12/27/2009 07:33:00 PM DiggIt! Reddit Del.icio.us Slashdot It!